Parque Nacional Cahuita has the largest system of coral reefs in Costa Rica, including six species of coral, a wide range of colorful tropical fishes. An occasional encounter of a harmless reef shark or sting ray is possible. 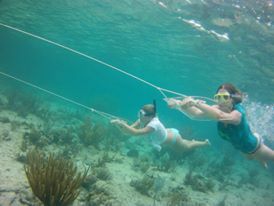 A scenic boat ride of twenty minutes will be followed by two snorkeling sessions. A delicious fruit and snacks break at the beach and a one hour guided hike in this wonderful coastal forest is part of the tour. Monkeys, sloths, birds, poison dart frogs, iguanas and other interesting encounters are common. 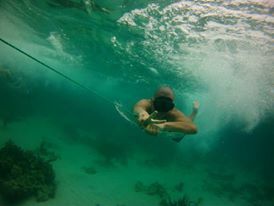 In Bocas del Toro we organize half day snorkel trips to different places. At hospital point you can snorkel next to an underwater wall. At the playground there are all kinds of coral and small reef fishes. The deep boarding is part of a full day trip which includes visiting dolphin bay, sloth's island and Zapatillas island, where we do the deep boarding. There we have lunch and enjoy an unforgettable day on the beach!